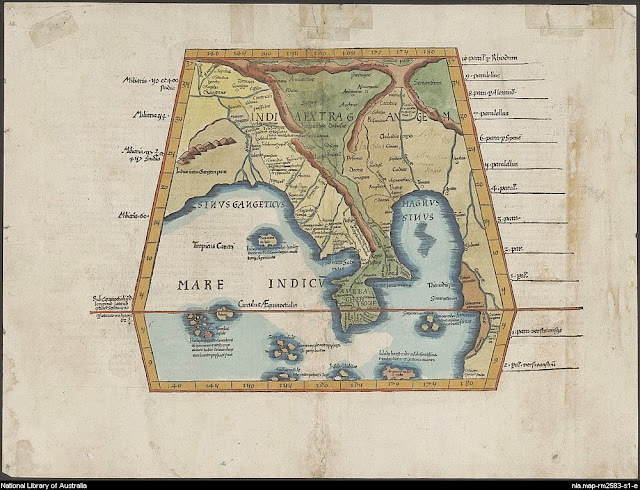 The great geographer Ptolemy's description of the different Indias and the Indian Ocean region has been dismissed by many or interpreted incorrectly. The location of the great Bay of Sinus Magnus has been placed in different locations even though Ptolemy places it in the furthest south-east of the Indian Ocean. Of course with the sinking of many of the lands since the time of Ptolemy adds to this confusion. 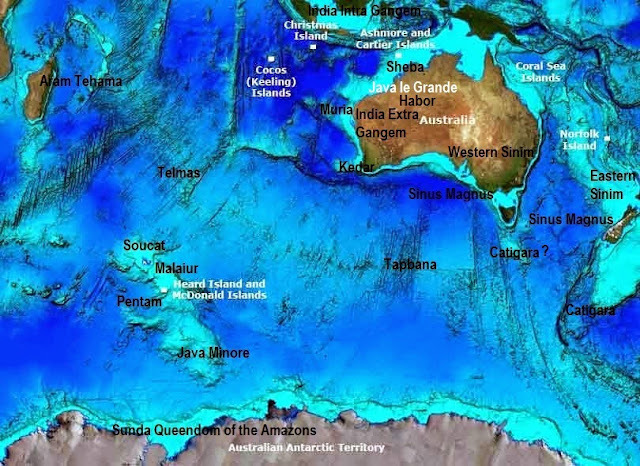 In fact the great Bay of Sinus Magnus is in the region of Australia's southern Ocean and Tasman Sea. 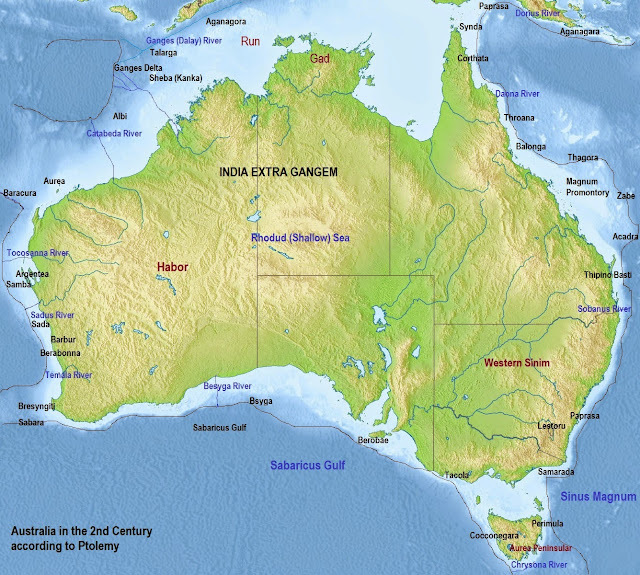 Ptolemy mentions Carmania (modern day India), then India Intra Gangem (South East Asia and Indonesia etc), then India Extra Gangem (Australia and New Zealand) where the Bay of Sinus Magnus is found in a south Easterly direction around 180 degrees longitude (starting from the Canary Islands). Some of the Tribe of Benjamin who came to Western China after 580 BC settled during the Zhou Dynasty on Eastern Sin or Sinim (Zealandia, which sank not millions of years ago but around 535-540 AD). They sailed from China to the Northern shore of Sinim probably where the Solomon Islands are today. The present Melanasian population of the Solomon Islands arrived there post 540. Around 535-540 AD with the sinking of much of Eastern Sinim some of these Sinimite Benjaminites fled back to Asia, they were confused by some with the Simeonites and some of them were among the Khazars (Q ydna). Others went East to South America. Others settled on Cipangu which is 2,400 kilometres from the pre 1530 coast of China east of Japan. Cipangu is not Japan though it was identified as such by later writers. Sometime after 1300 Cipangu sank beneath the waves of the sea. Many try to identify Sinus Magnus with the Gulf of Thailand and they place Catigara in Cambodia. However Ptolemy stated that Sinus Magnus was south of the Equator not north. The Northern tip of the gulf reached up almost to the southern coast of modern day New Britain which fits with Ptolemy saying it was 8 and a half degrees south of the equator. The Port of Catigara near modern day Broome was the port from which one left to go to Catigara. The most likely location of Catigara itself is on the western coast of eastern Sinim somewhere near modern day Macquarie Island, Auckland Island and Campbell Island region. The river we call the Ganges today was actually the original Indus River and its importance is stressed in the early Hindu writings. 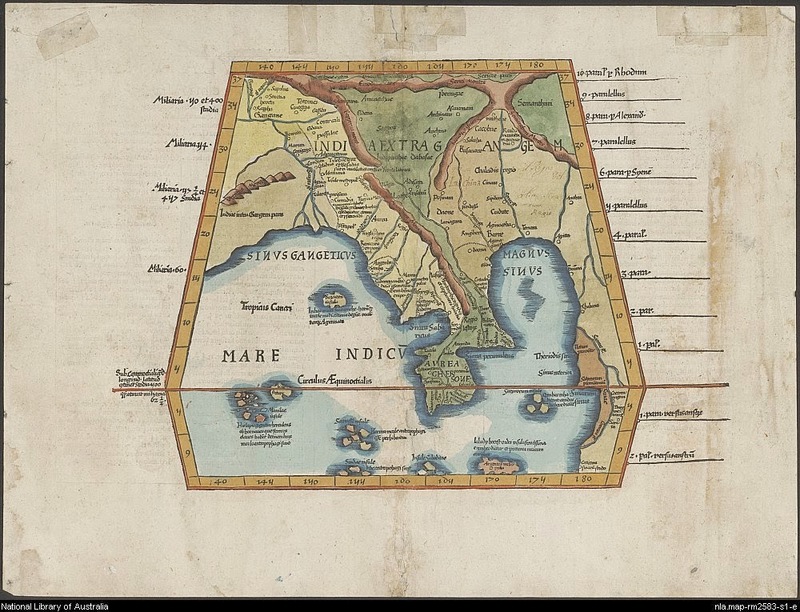 This has caused much confusion for those studying Ptolemy's geography of India. India to the ancients was not just the India of the modern day. India or the Indies were also the lands east and south of modern day India. The original Ganges River was the one called the Dalay River by Marco Polo near Chilenso City that flowed into the King Sound (called Brasil (Iron in Hebrew) by the Portuguese) south-east of modern day Java- they are both under the Timor Sea today. The modern Indus River was originally called the Sindh River. Alexander the Great penetrated further east than modern day scholars think as he reached the Ganges (Dalay) River on which the Gangaridai or the Rhodans (Rodudi) of ancient Australia ruled South of the River (part of the Timor Sea today). Their capital city was Ganga or Kanka (Canca) the City of the Chandika (Kandake) the hereditary Queen of Sheba. 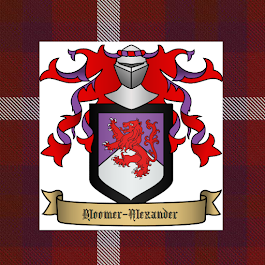 Tasmania was part of the Aurea Chersoneses (Gold Peninusular) which after 535 AD became separated from Tasmania (which was still connected to the mainland of Australia until 1606) and known as the Golden Isle (Aurea/ Zahab). Cape Fremose mentioned on early maps is found on the tip of Tasmania after 1530 (or the tip of the Aurea Isle before 1530) when Tasmania was still connected to the Australian Mainland. Cape Fremose was the Portuguese identification of the Beautiful (Jaffa/ Joppa/ Yafa) Cape which originally was situated at Kedar (now under the water as the Naturaliste Plateau). Tapbana also called Taprobane was the Copper/ Bronze/ Tin Isle (Nehash or Bedil) which was located between Australia (the Third India) and Antarctica. 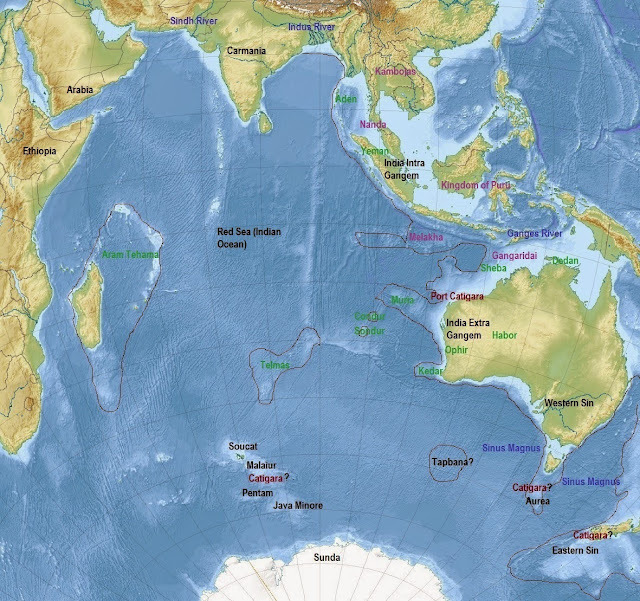 Ptolemy lists many coastal cities and ports in ancient Australia and New Zealand (The Third India) which are today under the Sea in most cases. Around 116-7 AD the Romans under the Emperor Trajan attacked and destroyed Parthia ( Ophir/ Patras) the home city of the Parthian Empire which was at the mouth of the Swan (Perth) Canyon (now under the Ocean). They established a secret Roman colony with its new capital of Berabona north of the Temala (Swan/ Eridannus) River. 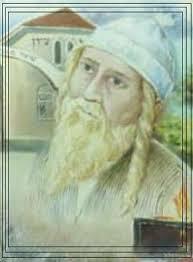 The name of the region was originally called Barbur (Swan in Hebrew) or Berabia. The Barbars were to establish trading colonies in Africa and around 1450- 1500 they moved their centre of operations to North Africa where they were known as the Barbary pirates and gave their name to the peoples of North Africa. The Portuguese would later connect the name Patras with Patos and Patos Pretos which meant black ducks (referring to the black swans). Due to the map makers confusion of Australia and South America, the Rio de Grande (separating Java and Australia in the old maps) and the Bay of Brazil (Iron/ Barzel) in north -western Australia and the Patos River (Swan River) was confused with the Lagoa de Patos and Rio Grande do Sul in Brazil in South America. This confusion also meant that the Cape of Catigara was located on some maps on the west coast of South America rather than on the coast of Eastern Sinim (near modern day New Zealand and Maquarie Island). Many writers have claimed that Juan Fernandez discovered New Zealand in 1576, others disagree. I believe that after the events of 1530 catastrophe that certain parts of Zealandia rose and others sank giving New Zealand a different shape as demonstrated in many 16th century maps. 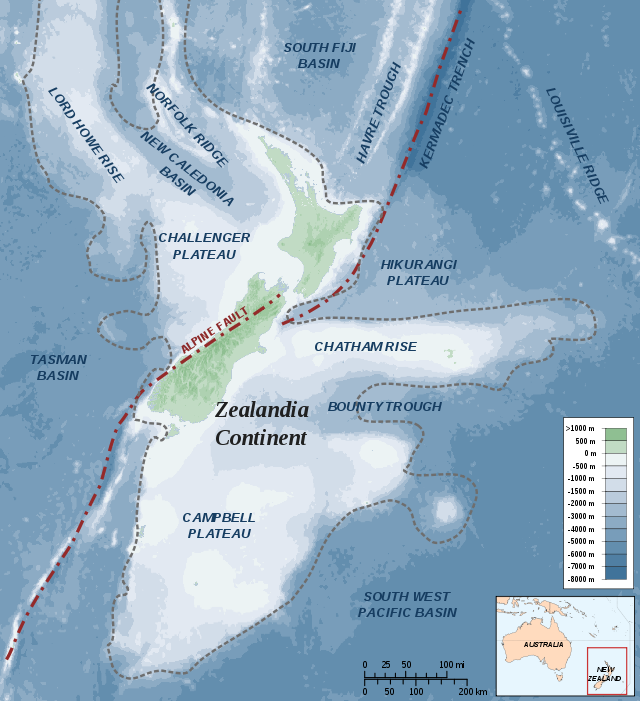 New Zealand's South Island stretched as far as Chatham and Pitt Islands (Chatham Rise) and may have included part of the North Island and was known as Maina Island. The northern tip of the North Island was separate and called Saill Island. Due to the cataclysmic events of 1606 most of the Chatham Rise sunk under the sea. It was this extension of New Zealand that Juan Fernandez discovered with its civilised, hospitable white population. Present New Zealand dates from 1606. It is not clear if the Maoris entered New Zealand post 1530 or post 1606 in the North firstly. These white Mainans were also called Children of the Mist (Cloud Warriors) by the Maoris and were the same people as the Manaan or Danaan of the mountains of Peru. According to the Maori legends there were three main kinds of white inhabitants of New Zealand- the tall 7 foot ones (the blonde Zebulonite Mainans of R1b U106 ydna), the ordinary white people many with red heads (Rhodans (Reubenites) of R1b U152 ydna and R1a Manassehites) and the white pygmies (the Leprechauns or little people of Irish legends). Legends of the white pygmies with golden hair involved with mining known as Tapuyas [probably of K* ydna (Kenite)] are also found in Paraguay and Brazil. 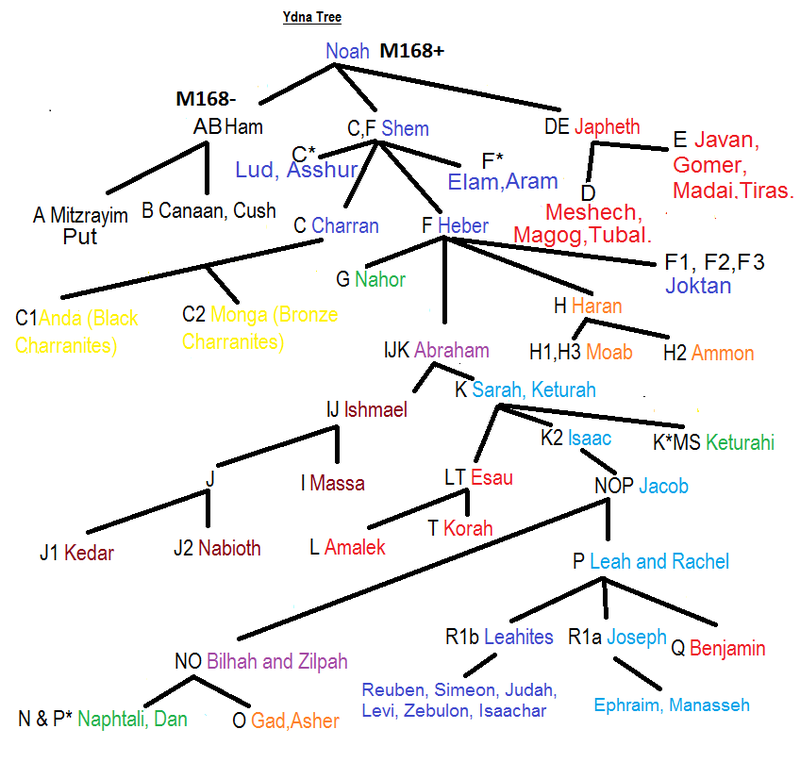 It would seem that after the Benjaminite Sinim left after the disasters of 535-540 AD that the Mainans settled in the last remnant of the former Eastern Sinim sub-continent. The Maoris were to eventually annihilate most of the remnants of these white tribes. There are some descendants still found in New Zealand fighting for the recognition of their claims. These pre Maori whites came from both South America and Australia. The so-called Urukehu whites are most likely originally from Australia as the Australian aborigines also spoke of fair skinned natives called Uru in their legends and Western Australia was in ancient times called Uruk. The Uru are also mentioned living in the Andes of South America. In the time of ancient Uruk, Sinus Magnum or the Tasman Sea was land ( a great valley). It was traversed by stone pavement thoughfares. One of these pavement roads began at the so-called Tessellated Pavement at Pirate's Bay (Eaglehawk Nest) in Tasmania going across to what would later be Eastern Sinim (on the Lord Howe Rise). Another great road or causeway is found north of this beginning in the Ocean south east of Lake's Entrance and Sale in Victoria crossing the plain to the hills which would later be the coastline of Eastern Sinim (on the Lord Howe Rise). There is another causeway south of the Tasselated pavement that goes across the Tasman Sea to Stewart Island and there is also a fork which leads towards the north part of the South Island of New Zealand. 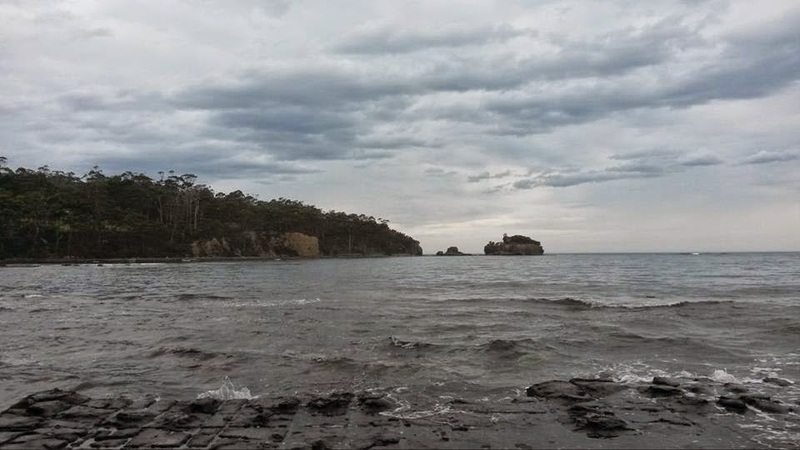 There may have been a major city now under the Sea near Eaglehawk Nest or possibly under the hills nearby (see the area of the Devil's Kitchen which may be the remnants of great fortress temple complex). The Dolerite rock of Tasmania may be the remnants of the huge Tower of Babel (Mt Wellington) and its surrounding city metropolis. The Tower of Babel was linked to other Towers in what are now Antarctica, Argentina and South Africa and other places. The Tasman Sea now may cover the ancient Plain of Shinar or Sinar where the original Tower of Babel was found. The tower itself may have been located at Mt Wellington in Tasmania. Noah's Ark may have landed in the Southern Alps of New Zealand on Mt Cook (Aoraki). After the cataclysmic events of the Tower of Babel the Ice Age began and humans moved to Sundaland (Indonesia and South East Asia) and Northern Australia (north-western Sinim) and from there they moved into Babylonia (Iraq) as the Ice withdrew. 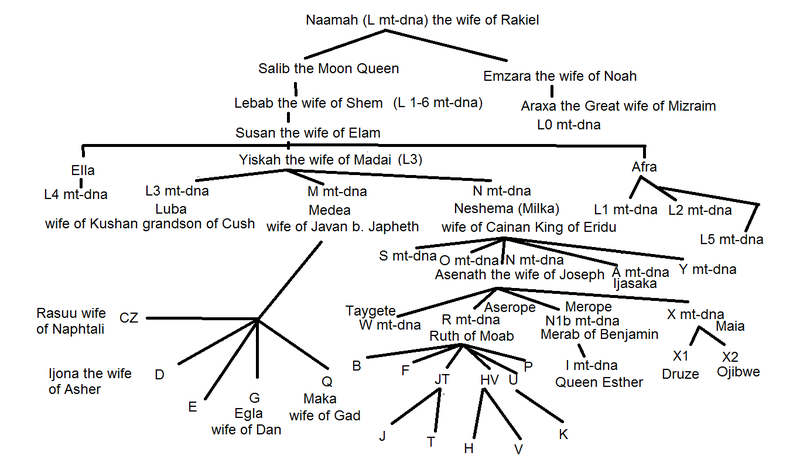 Abraham's family were part of this migration from Uruk (Ur Kasdim) in Australia to the Middle East. Some evolutionists believe in an "Out of Africa" theory. Some who try to read the genetic evidence according to this theory see a migration out of Africa via India to Australia. In fact the sons of of A ydna may have left Australasia for Africa before the Ice Age and they were isolated there during the the Ice Age. The post-deluge mankind came "Out of Australia" just over 4000 years ago. After posting this I by chance found a website about Ancient Celtic New Zealand that would seem to correspond with my own ideas. I have as yet not read the literature on this.